Thanks to its advanced full-composite construction, the Aurum HSP 1 weighs a svelte 32 pounds. 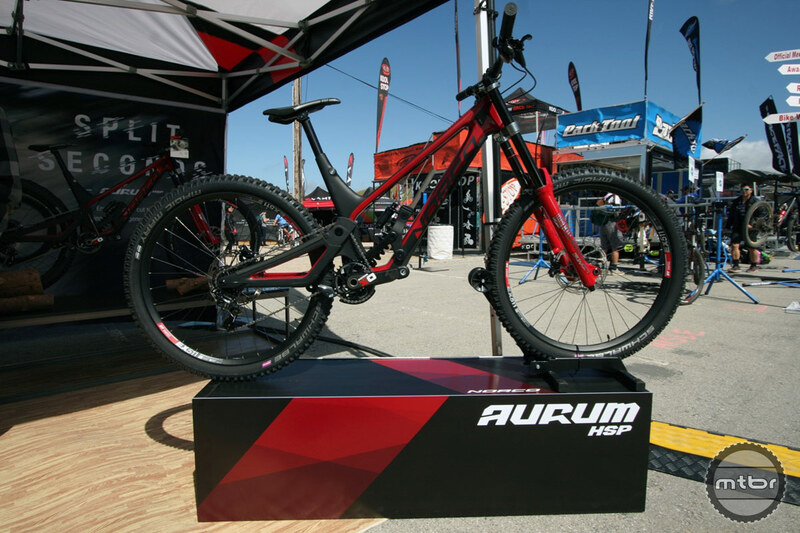 Canadian manufacturer Norco is proudly displaying their latest innovation at Sea Otter 2018, the Aurum HSP, a full composite 200mm travel downhill rig with a high single pivot design, available in both 27.5 and 29er wheel sizes. After a year of testing, riding and racing on the UCI World Cup Downhill circuit, the Aurum HSP has been put through the wringer and came out the other end in full production. Integral to Norco’s race development program, the advantage of this crazy-looking HSP design is an extreme rearward axle path for controlled management of square-edge hits, maintaining the bike’s momentum through the roughest terrain, reducing rider fatigue. Running the chain over an idler pulley up and over the suspension pivot helps minimize chain growth and pedal kickback, further stabilizing the performance of the Aurum HSP over mega chunder. The HSP design has an extreme rearward axle path for controlled management of square-edge hits. Video footage from last year’s World Cup Downhill circuit tells all. Watching the relaxed body positioning and movements of team rider Sam Blenkinsop is evidence of how capable the radically different Aurum HSP design is. 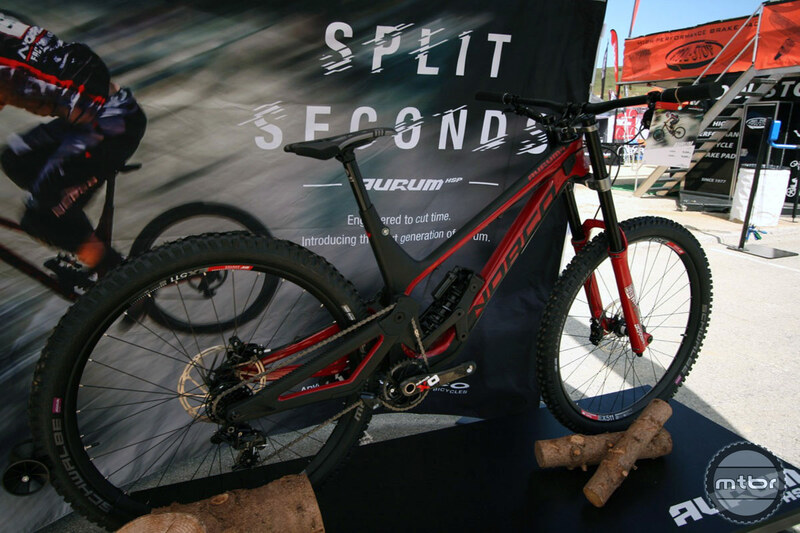 And thanks to its advanced full-composite construction, the Aurum HSP 1 weighs a svelte 32 pounds – incredibly light for a World Cup Downhill-specific rig. Equally different as the HSP design, the new Aurum is also available in both 27.5 and 29er wheel sizes (available in M/L and L/XL frame sizes only). The Aurum HSP also features a slick head tube with ovalized insert allowing 8mm of fore/aft steerer tube placement, fine tuning the top tube reach of the bike without having to change stems. 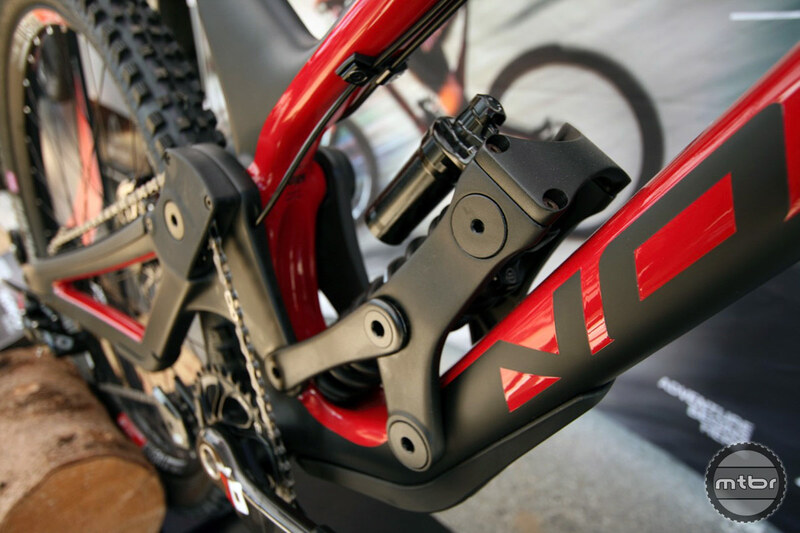 The HSP 1 features SRAM XO1 drivetrain with a RockShox Boxxer World Cup for $7999. The Aurum HSP is available in two build options. The HSP 1 features SRAM XO1 drivetrain with a RockShox Boxxer World Cup for $7999, while the HSP 2 sells for $5499 and is equipped with SRAM GX and a Boxxer RC. 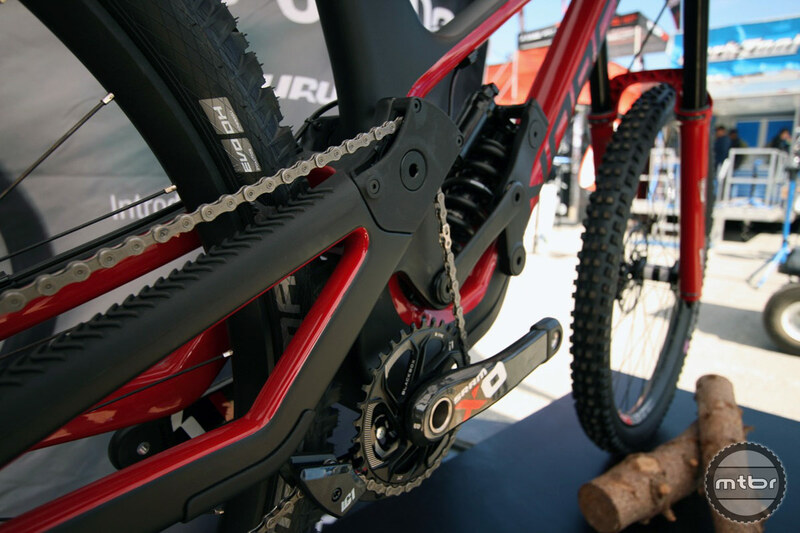 Both bikes are built with downhill-specific 7-speed drivetrains. For those who just want the frame, a kit with shock, headtube insert and rear axle runs $3299. Pictures can’t fully do justice to the Aurum HSP’s beautiful and rugged composite design. If you’re here at Sea Otter, stop by the Norco booth and get closer look. The new Aurum is also available in both 27.5 and 29er wheel sizes (available in M/L and L/XL frame sizes only). For more information, visit www.norco.com. This article is part of Mtbr’s coverage of the 2018 Sea Otter Classic in Monterey, California. For more from Sea Otter CLICK HERE.